Cooking acorn squash is so easy that the hardest part of cooking acorn squash may be cutting it in half. 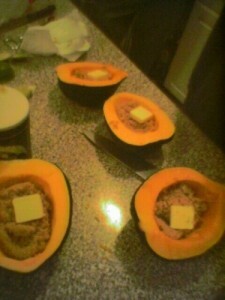 Learning how to cook acorn squash is easy. A sharp knife should be used to cut this squash because the skin is very thick and difficult to cut. The seeds should be scooped out and roasted in the oven for 20 minuets at 350 degrees. When roasted, the seeds can be salted and they taste a lot like pumpkin seeds and make a great snack. Squash is wonderful when roasted in the oven. A pat of butter and a tablespoon of brown sugar placed in the hollow before cooking will create a great tasting side dish when baked in the oven for one hour at 350 degrees. Place in a shallow baking dish with one half cup of water in the bottom. This will prevent the squash from sticking. Try eating more of this delicious vegetable that has also been reported to prevent spikes in blood sugar and prevent cancer. Acorn squash is one of the most nutrient rich vegetables available. It is rich in beta carotene, has 145% or the daily requirements of vitamin A in one cup and is rich in many other antioxidants. This squash is often over looked because many people do not know how to cook acorn squash. Because of the many health benefits, it should be incorporated into our diets more often.